The use of virtual reality (VR) has skyrocketed in the past few years and is making its mark on higher education in a significant way. NC State faculty are leading the way in using virtual reality in a wide spectrum of contexts across campus. DELTA has used VR to develop an interactive training for food safety inspectors and created a 360-degree spherical a field trip of a prescribed fire. Imagine if students were able to use virtual reality to be immersed in their designs to work out the kinks along the way? Or to prepare for their first teaching experience? That is what is happening with two DELTA Exploratory grants currently underway. Associate Professor of Landscape Architecture Kofi Boone has experimented with different techniques for students to communicate their design ideas for years. He has tried animation and filmmaking. Virtual reality tools are now used in landscape architecture. For Boone, virtual reality was a logical next step. His grant is seeking a better solution for graduate students to test out their design solutions through VR for an advanced media course. “How can we make a process, starting with our students, that teaches people to communicate their design work and their ideas using virtual reality from the beginning,” asks Boone. “It requires a great amount of work and a level of abstraction (drawings and models) to convey that. And there is never a moment when you can look around and immerse yourself into the design to check to see if you are doing things right,” he adds. 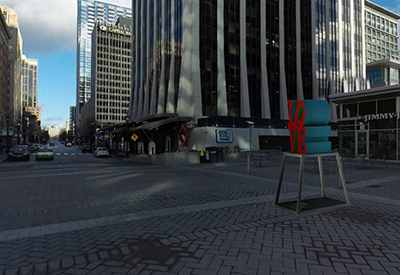 The project began on a small scale with students placing a digital rendering of a piece of public art on Fayetteville Street into a specific setting. Zeke Krautwurst, a graduate student in landscape architecture, and Skylar Kitchen, an undergraduate student in architecture, have been testing various methods to augment their designs in a 360-degree photosphere and had success stemming from a couple. Boone anticipates that by taking objects and placing them into different settings, students will begin to learn a process for determining the impacts of spatial changes to landscapes. “So placing the object in the picture and allowing you to look at it in that immersive world, no matter which way you turn your head, you can see how the new thing feels in the context to what is actually there,” he says. “The suspicion is that [students] can eventually make those decisions faster in a self-directed way, not requiring an instructor to come in and tell them what is right and wrong,” Boone says. Throughout spring 2016, beta testing is underway with Boone’s research assistants. Other students are also becoming increasingly aware of the work and have expressed an interest in incorporating some of the new techniques into their master’s coursework. 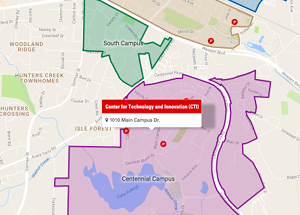 The potential for students to display their designs in the virtual image of their site location will open up many avenues for community design input as well. “We want to make a process, starting with our students, that teaches people to communicate their design work and their ideas using virtual reality from the beginning,” Boone explains. “Elsewhere, it is difficult to pull together this range of effort and expertise with this level of grant funding, but DELTA has been able to do it and it is starting to pay off,” Boone says. DELTA’s VR experience with the Department of Food, Bioprocessing and Nutrition Sciences aims to assist students in a different way. Producing a virtual-reality video is a complex process. “We never would have thought about applying for an exploratory grant if we had not first discussed it with DELTA,” says Natalie Cooke, postdoctoral teaching scholar and program director for A PACKed Kitchen, a satellite partnership of the Inter-Faith Food Shuttle and Share Our Strength. Cooke and Suzie Goodell, associate professor in nutrition, reflected on their first DELTA Grant in 2014 when converting a seated course for distance education delivery. They were in search of ideas to replace live field trips so DELTA used 360-degree spherical video to take distance education students on a virtual tour of Grand Asia Market. This cycle, Cooke and Goodell are using 360-degree VR technology in a new way—as a virtual teaching experience to transport their students into a teaching role in front of a “live” audience. 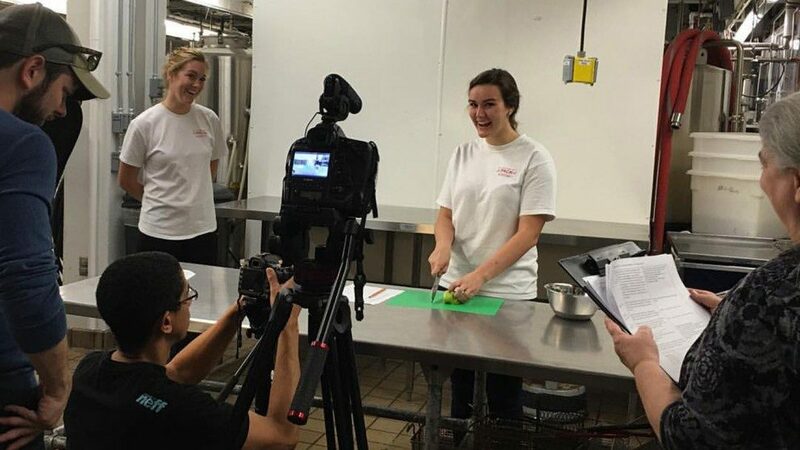 NC State students enrolled in NTR 420 Community Nutrition work in groups to prepare lessons and instruct community classes about nutrition—from knife skills to making recipes more healthy. 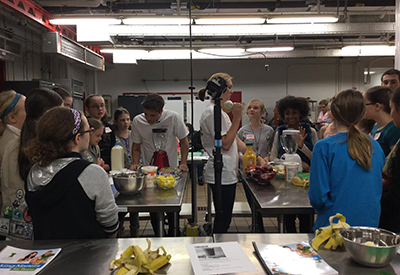 The students teach groups of senior citizens or students from the local Boys and Girls Club, cook a meal, dine with them and discuss what they have learned about nutrition from the session. No matter how prepared Cooke’s students seemed prior to teaching a “Cooking Matters” class, when they went to teach the class, they were still apprehensive, she says. Comments like “I wish I knew… I wish I had seen… If only we had been to a Cooking Matters class before going into the community…” repeatedly surfaced in the end-of-semester focus group, explains Cooke. For this grant, the duo had a two-fold goal: to lower student anxiety and expose them to conflict resolution scenarios by placing them into a realistic teaching situation as well as to decide the feasibility of using 360-degree video for student teaching evaluation. The collection of conflict management training videos allows students to experience a first-person point of view or from the viewpoint of a co-instructor. Both types of videos allow the students to recognize when they may need to step in and help with a conflict when they are a supporting instructor and not the lead. In addition to the immersive learning experiences brought by VR, students also have a chance to learn how to respond effectively to common conflict management situations. In the recording of the conflict management videos, staged disruptions are introduced into the community classroom to give students opportunities to pause and discuss how they would resolve various issues. Students work in teams to view a conflict scenario using Google Cardboard and they discuss possible resolutions. Once the team’s decision has been made, students view two resolutions—both good and bad. As a team they discuss the outcome of their decision and the implications. Because the pair received an exploratory grant, the learning experience may include successful outcomes. However, learning occurs even if your vision needs a bit of tweaking. Virtual reality is changing learning in the classroom and will have effects far beyond the university into people’s daily lives. There are many potential uses of VR in the academic environment. If you’re interested in applying for a DELTA grant, consultations with DELTA staff are available now through April 29 with proposals due May 6.